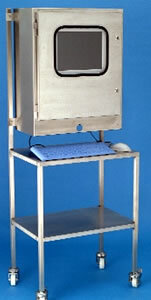 Touch screen slimline waterproof enclosure to protect desktop PC’s in factory environments. With a 15” TFT monitor mounted in the door, a rubber keyboard and rubber mouse all sealed to IP65, the tower or desktop PC sits protected inside the stainless steel enclosure. Manufactured in stainless steel and sealed to IP65, the PC-Guard enclosure will allow a standard desktop to operate properly in hostile environments. Protecting your investment and ensuring that your production continues to function at full capacity 24 hours a day. Use a Waterproof enclosures to protect computers and PC's. Our 316 stainless steel enclosures are sealed to IP65 and will accept up to a 19" screen and processor unit. In wet areas a Waterproof enclosures and desktop PC is the low cost alternative to an Industrial PC's .